City Packages — Copenhagenize Design Co.
We all want to make our city better and improving the conditions for cycling and cycling policy is a brilliant place to start. 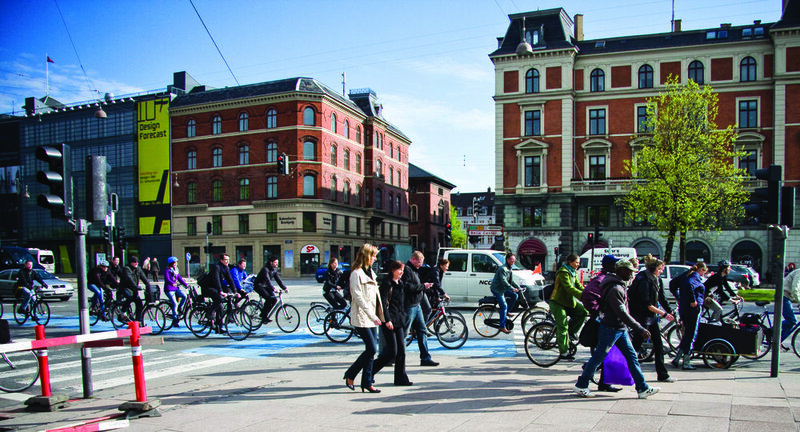 Copenhagenize Design Co. offers comprehensive coaching packages for cities and governments - regardless of what stage your city is at on the road to modernization. We will be your trusted partner, providing you with advice based on your local needs and applying our international expertise in all matters relating to urban cycling. Including planning, policy, communication, micro and macro design and master classes. You will have full and unrestricted access to our passion, experience and vision in these coaching packages. We will be dedicated to your team and work hand-in-hand with you for the entire duration of our time together. Below we outline the different coaching packages and we are always flexible about any specific needs you have. We can tailor-make a coaching package for your city if necessary. We will coach you on all the details of your current or future bicycle infrastructure strategy and policy, as well as your city's approach to communication & branding. After careful discussion about your specific needs, of course. Positioning your city for a fast track to worldclass. During a focused meeting we will explore the exact routes and goals that you have outlined for your city, with the upper management and policymakers. We will form a result-oriented road map for achieving the goals that we establish together. The Platinum package includes 2-3 visits by our team to your city; an initial four day visit at the beginning, a final presentation of our results & recommendations and, if necessary, a visit in the middle of the process. In this package we offer a face-to-face meeting with your Mayor and other key politicians in order to highlight the importance of investing in bicycle traffic and equipping them, if necessary, with the language that best broadcasts the message to the electorate. We will listen to their ideas and concerns in private and off the record, in order to get a sense of the city. We will bring our exclusive master class to the city in order to make sure that your key employees (planning, engineering, health, etc) and manage- ment are all on the same page regarding planning for bicycles and forming policy. This one day master class will inform and inspire and bring our team closer together with yours in order to achieve our common goals. After our four intial days of observing, discussing, brainstorming, analysing and benchmarking we will present your team with our preliminary insights and thoughts about your city’s current position and discuss them with you. The fee includes an inspirational keynote by our CEO about how cities should be designed first and engineered second. You can decide if it is a public or staff-only keynote. In either case, all you have to arrange is the venue. In our final, 30-40 page report we will outline our insights and thoughts about your current position, the goals achieved and develop a comprehensive idea catalogue featuring our ten key ideas that are crucial to taking your city to the next level. During the entire six months we are readily available for sparring with your key employees on all aspects of our project(s). 1 senior urban planner (or CEO, depending on availability) + 1 junior of Copenhagenize Design Co.
During a focused meeting we will explore the exact routes and goals that you have outlined for your city, with the upper management and policymakers. We will form a result-oriented road map for achieving the goals. Includes a three-day visit at the beginning of the coaching to attend all the necessary meetings and site visits, as well as a first insights presentation at the end of the visit, and the second visit wraps up the process with a presentation of the recommendations of our final report and discussions for how your city can proceed. ogether with key employees and management we will particpate in a two hour brainstorm to outline and discuss the four month coaching period, establish clear, result-oriented goals and develop a collaboration format. After three days of observing, discussing, brainstorming, analysing and benchmarking we present you with our first insights and thoughts and discuss them with you. The fee includes an inspirational keynote for all the city staff about modern urban design and examples from around the world for inspiration. In a 20 page final report we will outline our insights and thoughts about your current position, the goals achieved and develop a comprehensive idea catalogue featuring our seven key ideas that are crucial to taking your city to the next level. We make ourselves available for two Skype meetings in order to spar, exchange experiences and give you feedback about the process you are involved in - all in order to maximize your outcome. 1 senior urban planner + 1 junior of Copenhagenize Design Co. The Silver package provides you with valuable coaching to get you started on the journey towards a bicycle-friendly city or coaching on specific projects that you have planned. The all-important kick-off meeting with management and key employees to establish the road map for our collaboration. We discuss the specific needs, challenges and targets of your city's plans. At the beginning of the project we fly in for two working days for the kick-off meeting, the brainstorming with key employes and management, and site visits. Important meeting with key staff and management: Together with you we assemble - depending on the project’s aim - the right mix of participants for a two hour brainstorm about how we can bring the city’s bicycle policy to the next level. In a 15 page final report we will outline our insights and thoughts about your position in becoming a bicycle friendly city and develop a comprehensive idea catalogue featuring our five key ideas that are crucial to taking your city to the next level. The Inner Circle is a closed forum primarily for politicians but also select high-ranking management staff. Our CEO provides exclusive one to one coaching over a minimum of six months. Our CEO is available to you as coach and sparring partner, helping in all matters regarding urban cycling, planning, communications and other aspects of liveable cities. Using our international expertise, you'll be provided with inspiration from around the world that applies directly to your city/country. This is an exclusive coaching offer for politicians and select management staff. During the first meeting in your city you will establish contact, outline specific needs and challenges facing you and your team and define how we can support you best in your work. Thereafter, our CEO is at your disposal on a monthly basis as your personal sparring partner. You'll get feedbabck regarding how to communicate your goals and projects to the citizens, how to tackle the usual feedback from the various departments in the transport area, how to reach out to the cyclists in the city, what kind of infrastructure is best suited to specific locations, etc. Our CEO also coaches you on how to talk to your Mayor, traffic engineers, urban planners, etc. Communication can done by email, telephone calls or Skype. The names of the members of the Inner Circle will not be public knowledge.